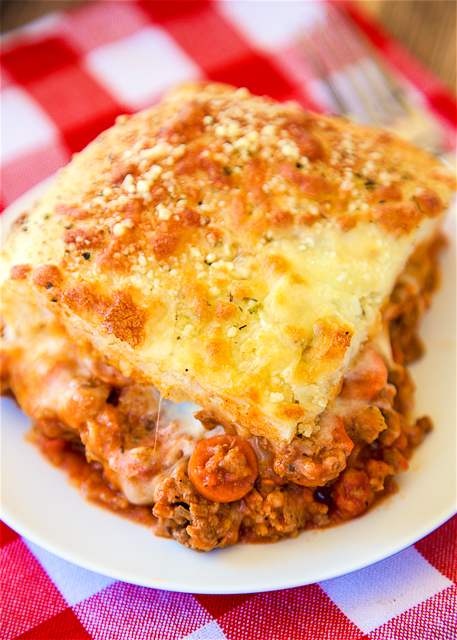 Meat Lovers Pizza Casserole - a family favorite!!! Lean ground beef, sausage, pepperoni, pasta sauce, mozzarella cheese, pizza dough and parmesan cheese. Can add your favorite veggies too! Everyone loved this! There weren't any leftovers!! YUM! My favorite food is pizza. I could eat it for every meal every single day. That being said, I am always thinking of new ways to make pizza. I don't want Chicken Legs to get tired of having pizza! 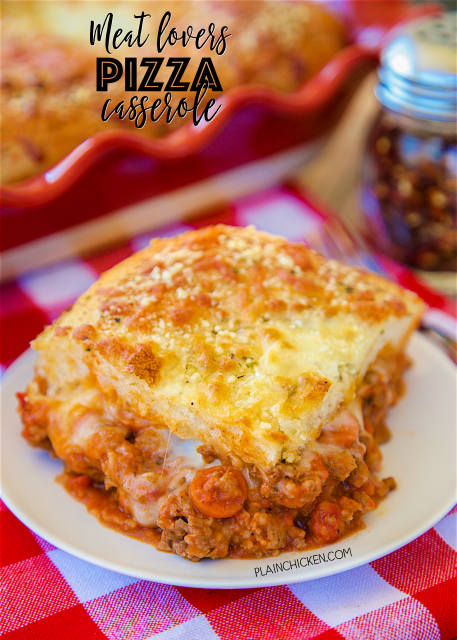 This Meat Lovers Pizza Casserole was fantastic! We both absolutely loved it!! I used hamburger, sausage and pepperoni in this casserole. Feel free to add some veggies to the mix too!! The crust on this pizza casserole is on top. I used a can of refrigerated pizza dough and brushed it with some olive oil, Italian seasonings, mozzarella and parmesan cheese. CRAZY good! Preheat oven to 425º F. Lightly spray a 9x13-inch pan with cooking spray. In a large skillet, cook ground beef and sausage over medium-high heat until no longer pink. Drain well and return to skillet. Add pepperoni, flour, and 3 tsp Italian seasoning; stirring until blended. Stir in pasta sauce. Bring mixture to a boil over medium-high heat. Remove from heat and spoon mixture into prepared pan. Sprinkle with 1-1/2 cups mozzarella cheese. Unroll pizza crust and place on top of mozzarella cheese. Brush crust with olive oil and sprinkle with remaining teaspoon of Italian seasoning, 1/2 cup mozzarella cheese and parmesan cheese. Clever way to get your pizza fix Steph. Looks very good. We really liked this it's a keeper! Do you use Tennessee pride sausage or Italian sausage? Looks delicious - going to make for company.